Sunday morning, the quiet kind that I don’t get enough of. Until a minute ago I’d been on my second cup of coffee, reading Dreamland and starting to think about breakfast. Hopalong, dozing at my feet, stirred briefly as my phone went off. I saw from caller ID it was Burke Cunningham. I almost didn’t answer, and not just because I liked listening to my new ringtone. A call from Cunningham on a Sunday morning was like the cluck of a dentist as she works on your teeth. The news can’t be good. On the other hand, because he’s one of the most sought-after defense attorneys in Columbus, Ohio, the news would probably involve a job, which I could use right at the moment. But it also meant an end to a quiet Sunday morning of the kind I don’t get enough of. I answered anyway. Unlike my conscience, my bank balance always gets the better of me. 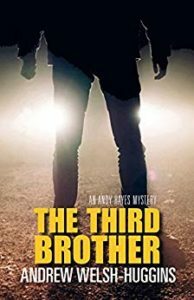 Andrew Welsh-Huggins is a crime reporter and author of the Andy Hayes private eye mystery series. You can sign up for his newsletter on his website and keep up with him on Twitter and Facebook. And you can follow his recommendations for some of his own favorite PI reads, including Sue Grafton’s Kinsey Millhone series (and whenever the wonderful Sue Grafton is mentioned, I like to give a plug for the work of her father, C.W. Grafton, The Rat Began to Gnaw the Rope and The Rope Began to Hang the Butcher, two of my all-time favorite mysteries). Andrew also gives a shout out to Robert B. Parker’s Spenser and Rex Stout’s Nero Wolfe series, and authors Dashiell Hammett, Ross Macdonald, and John D. MacDonald as masters of the PI genre. We talk about his nonfiction book on the death penalty, but neglect to mention the title. Let me correct that oversight: it is No Winners Here Tonight, and you can learn more through this link to the write up on Andrew’s website. As always, if you’d rather read than listen, the transcript is below. Laura Brennan: Andrew Welsh-Huggins is a reporter for the Associated Press whose beat includes crime, the death penalty, and politics — an explosive combination. 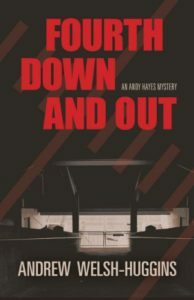 He has translated that experience into two non-fiction books and five crime novels featuring Andy Hayes, an ex-Ohio State and Cleveland Browns quarterback and current private eye. Andy has a wisecracking attitude and an affinity for trouble. Andrew, thank you for joining me. Andrew Welsh-Huggins: Thank you for having me. Great to be with you. LB: So you are a career reporter. What was the draw of journalism? AWH: Well, I’d always wanted to be a writer. Early in my career after college, I think it was a natural transition to get into writing professionally. I’d worked for both my high school newspaper and my college paper, and grew up reading — there was actually a time and we got two newspapers a day in my house growing up and the New York Times every Sunday. It just sort of made sense for me to follow journalism. And I also saw that as a path into fiction writing as well. It just took me a while to get there. LB: Were you always writing fiction on the side? AWH: Yes. I’m one of those kids who was writing stories at a very young age, usually mystery short stories as a young man. But just was always trying my hand at fiction, and particularly I was always attracted to the private eye genre. I’ve always loved Sue Grafton’s Kinsey Millhone, and Robert B. Parker’s Spenser, some of the older series like Nero Wolfe with Archie Goodwin. Archie Goodwin, actually, has a lot in common with my character, Andy. LB: So let me ask you: why a private eye as opposed to, say, an investigative reporter like yourself? AWH: So, a lot of what I do as a reporter in terms of investigating, finding documents, talking to people, sort of translates directly to what Andy does. Certainly there are reporters in all of the books. And I also haven’t ruled out some day writing a book with a reporter as a protagonist, I just haven’t quite come up with the best idea yet. LB: It’s so interesting that you would have mentioned Archie Goodwin, because I absolutely see Archie in Andy. AWH: Yes, Archie is such a great character. I always say, if people aren’t familiar with that series, Nero Wolfe was the heavyset guy sitting on the third floor of his New York brownstone thinking about the puzzles while he sent Archie out to actually put himself in danger and get the answers. I learned a couple of books into the series that Archie Goodwin actually, fictionally, is from Ohio. Now, Rex Stout could never quite decide if he was from Chillicothe or Zanesville, but I always liked that connection, that he’s actually an Ohioan. Andy is kind of the same way. He’s got that kind of Archie Goodwin wisecracking attitude and he’s got an eye for the ladies and he’s constantly putting himself out there poking the stick at the wasps’ nest to see what happens. It doesn’t always work out very well at first but it usually gets results in the end. LB: How did you develop the character of Andy? AWH: Knowing that I wanted to do a private eye, the key thing for me was where he was going to operate out of and what was going to be his back story. By the time I started writing the series, we’ve been living in Columbus for about 10 years and it took me that long to realize that this was the city where I wanted to set a series. I wanted a strong geographical presence and I knew it was going to be Columbus. In terms of the back story, so many private eyes have some kind of baggage they’re carrying, whether it’s, maybe they’re ex-military or maybe they’ve served time. And it didn’t take me very long being in Columbus to realize that the best baggage someone from here could have was to have been the equivalent of a gladiator type hero in Columbus, which is to be an Ohio State football star. And the baggage you would carry if you just completely screwed up and went from being at the top of the sports pile to the bottom. That’s why Andy became an ex-Ohio State guy. LB: So you have five book so far in the series. AWH: That’s correct. Five books and then the sixth book, Fatal Judgment, comes out in April. LB: Let’s talk a little bit about your most recent book, book number five, The Third Brother. If someone hasn’t picked it up yet, what do they need to know to be able to follow our conversation? AWH: The Third Brother weaves together different current events, themes, but also some things I’ve done, covered as a reporter recently. There was a case a few years back where someone shot up a recruiting station, a military recruiting station, in Chattanooga. There was this very strange thing that happened after that. All around the country, bands of militia people started showing up outside military recruiting centers carrying weapons and sitting in chairs. And they were there to “guard the centers.” And that happened here in Columbus. Around the same time, I covered a case of a young Somali man — Columbus has a very large Somali population and 99.9% hard-working, law-abiding people. But one young man had gone to Syria and become radicalized and then come back and was arrested. I was so struck by how completely clueless his family was about what had happened. They had no idea that he had gotten involved in this. And so The Third Brother looks at extremism from all sides. It explores White extremism, White Supremacy, and it explores Islamic radical fundamentalism, and just tries to explain how people can go so far over the edge. The plot itself involves a missing Somali boy, a teenager, who of course the government assumes he has become radicalized, but his family says that’s impossible. They want Andy to find him before something terrible happens to the boy. LB: Well, and you are something of an expert on this, because you’ve written a nonfiction book on just the subject, called Hatred at Home. AWH: That’s right. Hatred at Home is based on, back in 2003, there were a series of prosecutions of three guys in Columbus. A very interesting case, these are one of the very first domestic terrorism prosecutions after 9/11 and the invasion of Iraq. We are very accustomed to seeing these indictments now, they almost don’t even make the news anymore, but back then this was huge national news. And it was even a more interesting case because there were three friends who all lived in the Columbus area but there were all prosecuted separately, they were all accused of different things, and it was a real test of the government using a particular type of antiterrorism law at the time. I covered a lot of those cases as a reporter, and then I wrote a book which is kind of the soup to nuts telling of their stories, the history of how they grew up, where they grew up, what they were accused of and how the government went after them and what happened from there. And I should say, one of those men is a Somali immigrant. He has actually been deported and is back in Somalia. LB: While the plot of The Third Brother, the elements that you used, do seem ripped from the headlines — we’ve become, I fear, rather numb to so much extremism. What I thought was interesting that you did with it was that you found the humanity underneath all of the characters. How did you approach that? AWH: You know, as I tried to mature as a writer, I’m very conscious that people are not always black-and-white and even the most evil or the most good people are not all black-and-white. That’s a very obvious thing to point out, but I was trying to explore that a little bit. I mean, I’ve covered the Somali community in Columbus for years and I think I’m pretty familiar with the individuals there and I clearly wanted to get at this idea that this is a varied community, just like every other community. I was pretty sensitive to portraying them in kind of a sophisticated light. But frankly I was trying to put myself in the shoes of these militia guys that I covered is reporter sitting in parking lots and they thought they were doing the right thing. They considered themselves patriots and they had their own motivation. So I think that was part of what I was trying to do; this is not an either/or type book. Hopefully extremism doesn’t come off in a good light, but I think the idea was to draw some subtlety as I was creating the adventure. LB: One of the fun moments in the book is when somebody compares Andy, to his face, to Lew Archer. And Andy fires back not that he sees himself as Sam Spade but that he sees himself as the Continental Op — also Hammett, but the Continental Op is the guy who sees moves 10, 20 moves ahead. AWH: Well, Andy is not immune from tooting his own horn a little bit, perhaps even more than he should, and part of my intent there was to give readers some insight into Andy, but also just sort of a nod to the tradition. I try to — I don’t do this every year — but most years I try to read one Dashiell Hammett, one Ross Macdonald and maybe one John D. MacDonald or someone else, just to keep myself in that tradition. So that’s part of what was going on there. LB: What is it about Hammett that you like so much? LB: Oh, yes, The Dain Curse. AWH: There’s just kind of an element of percolating violence that’s just below the surface and sometimes comes up to the surface that appeals to me. I like the fact that he — I’m obviously not the first person to say this, but he’s the one that helped take the detective story out of the drawing rooms and onto the streets and create characters who are really out there putting themselves in danger and a lot of times doing things that maybe wouldn’t have the best consequences. That sort of early, raw approach to the genre really appeals to me. And I like just educating myself on those themes and those stories because I think they help me as I try to write something that’s obviously set a hundred years later. LB: Your other nonfiction book was about the death penalty. AWH: That’s right. That was my first book and that came about — it started when I wrote a series of stories back in 2005 or so about the death penalty in Ohio. I analyzed 20 years worth of capital punishment, or capital indictments and tried to figure whatever happened to all these people who would face the death penalty at one time. No one had ever done this before in Ohio and no one has ever done it since. It was a huge, huge undertaking. It actually took me three years to write the stories and to do that research. And when I finished that, the stories pretty much concluded that, like every place else, that the death penalty here is implemented unevenly. It all depends on where you are prosecuted, what the political party of the prosecutor is in many cases, and also the race of the victim in the case. None of this is new to Ohio, but it had never been pointed out before. And once those stories came out and I had done some additional reporting, I decided to turn it into a book. It was a very interesting experience, putting the research out there, but I also was able to do a history of the death penalty in Ohio back to the late 1700s. I’m proud of the fact that that book is the definitive history of the death penalty in Ohio. I continue to write about it, and in fact I covered an execution about a month ago. So is still a topic that’s very current in the state. LB: You really are like a detective. AWH: You know, I’m often asked about whether being a reporter helps me as a mystery writer. Often what I like to say is that the experience I’ve gotten covering stories obviously helps me quite a lot and you see a lot of story elements my books that in fact I have covered as a reporter. But I also like to point out that being a fiction writer is a very different animal and it’s been an interesting lesson for me to translate what I do is reporter and then adopt the separate discipline a fiction writer which involves all sorts of other elements from plotting to characters to creating a realistic sense of place. So I don’t think people should take for granted that just because I’m a reporter means I can be a good fiction writer. I hope that I’m doing a good job at doing both, but often I have to tackle both in a different way. LB: You have a sixth Andy Hayes book coming out. LB: What can you tell us about that one? AWH: It’s interesting the characters that people will tell you about after you’ve written a couple books and the ones that you didn’t necessarily think that people would pay attention to. But in the very first book, Fourth Down and Out, Andy has a relationship with a judge. It’s a weekly appointment that he and the judge have, every Sunday, where they meet essentially for a sexual rendezvous. The judge has no interest in a relationship and Andy has his own issues with his life and is certainly happy to have this. At the end of that book, Andy breaks it off and it’s a bit of an ugly scene. And that was the story of the judge. But over the years, so many people have asked me about that judge. They want to know more about her, they want to know more about that relationship, and so I finally decided, okay, I heard you. And so Fatal Judgment opens with that judge after five years of no contact getting hold of Andy, asking to meet him, and telling him that she’s in trouble. They have a brief meeting and in the midst of that meeting, she gets a very upsetting phone call. She won’t tell Andy what it’s about, she dismisses him and she drives away. He then investigates a little further and realizes that she has disappeared. He can’t find her, she’s not in her condo, and from that point he follows a series of clues to find out what happened to her because he knows something’s wrong and can’t figure out what it is. So that’s Fatal Judgment. It brings the judge back, and it also has Andy trying to find out what’s happened to her and along the way he uncovers a case of a missing man in a county north of Columbus and lots of other clues and mysteries that he has to solve. LB: Oh, I can’t wait! AWH: Yeah, I was going to say the other thing about it, is about a third of it is set in Cleveland so we get some more back story on Andy’s very tumultuous and short time with the Cleveland Browns. My wife is from Cleveland and it’s always been sort of a second Ohio home for me, so it was enjoyable to revisit some of those experiences through Andy’s eyes. LB: What else is on tap for you? AWH: Well, I do write some short stories so I’ve got a few of those in the works. I’m also editing Columbus Noir for Akashic books. If people are familiar with that series, these are collections of noir stories set in cities around the country and around the world and I’m editing Columbus Noir. I’m pretty excited about the stories that we have in that anthology. That won’t be out for a year or so but it’s starting to get close so I’m pretty happy about that. I have a standalone book that I’m trying to shop around. I’m also researching a nonfiction book about a sort of amazing heist of a Brinks warehouse in Columbus a few years back in which the team of burglars from Massachusetts almost got away with $90 million, but in the course of events, there was so much money in the vault, they actually set it on fire with their cutting tool. And all kinds of funny and crazy and amusing things happened around that story. LB: So if people want to keep up with all of your doings online, where can people find you online? AWH: I usually point people first my website, AndrewWelshHuggins.com. If they’re on there, they’ll get a little prompt to sign up for my newsletter. I always encourage people to sign up for that if they want, it’s a very low impact newsletter. It comes out about every six weeks and it consists of some pictures and photos of my favorite bookstores I run into them. I include usually five books that I’ve read recently and I recommend. And then it has a calendar of events and some other things on there. I also have a Facebook page and of course I’m on Twitter, @AWHColumbus. LB: I will link to those in the show notes. Andrew, thank you for joining me today. AWH: It’s been really great. Thanks for the great questions.